Mohandas Gandhi? Louis Fischer? Henry Powell Spring? Martin Luther King? An eye for an eye will leave everyone blind. I have read that Gandhi spoke this statement or something similar, but I haven’t yet found a precise citation for this. Could you find out when and where Gandhi said this? “An eye for an eye leaves the whole world blind” is frequently attributed to M. K. Gandhi. The Gandhi Institute for Nonviolence states that the Gandhi family believes it is an authentic Gandhi quotation, but no example of its use by the Indian leader has ever been discovered. The YBQ notes that an important biographer of Gandhi, Louis Fischer, used a version of the expression when he wrote about Gandhi’s approach to conflict. However, Fischer did not attribute the saying to Gandhi in his description of the leader’s life. Instead, Fischer used the expression himself as part of his explanation of Gandhi’s philosophy. QI thinks some readers may have been confused and may have decided to directly attribute the saying to Gandhi based on a misreading of Fischer’s works. An eye-for-eye and tooth-for-tooth would lead to a world of the blind and toothless. QI has located relevant variants for this longer expression in 1914 and 1944. Below are selected citations in chronological order. Mr. GRAHAM: We can argue all we like, but if capital punishment is being inflicted on some man, we are inclined to say: ‘It serves him right.’ That is not the spirit, I believe, in which legislation is enacted. If in this present age we were to go back to the old time of ‘an eye for an eye and a tooth for a tooth,’ there would be very few hon. gentlemen in this House who would not, metaphorically speaking, be blind and toothless. The Spirit and Beings continue unselfishly to maintain life upon our planet, restoring us nightly, and forgiving us our wilful blindnesses far beyond our spiritual or bodily capacity of repayment. If the Spirit, Who is Life, exacted an eye for an eye, or a tooth for a tooth, this world would indeed be peopled with the blind and the toothless. The shreds of individuality cannot be sewed together with a bayonet; nor can democracy be restored according to the Biblical injunction of an “eye for an eye” which, in the end, would make everybody blind. Any attempt to introduce democracy or to check totalitarianism must constantly emphasize the rehabilitation of personality. Freedom and responsibility help. Rigid authority hinders. Satyagraha is peaceful. If words fail to convince the adversary perhaps purity, humility, and honesty will. The opponent must be “weaned from error by patience and sympathy,” weaned, not crushed; converted, not annihilated. Satyagraha is the exact opposite of the policy of an-eye-for-an-eye-for-an-eye-for-an-eye which ends in making everybody blind. You cannot inject new ideas into a man’s head by chopping it off; neither will you infuse a new spirit into his heart by piercing it with a dagger. Violence as a way of achieving racial justice is both impractical and immoral. It is impractical because it is a descending spiral ending in destruction for all. The old law of an eye for an eye leaves everybody blind. It is immoral because it seeks to humiliate the opponent rather than win his understanding; it seeks to annihilate rather than to convert. FIRST MAN: We should defend ourselves. An eye for an eye, a tooth for a tooth. TEVYE: Very good. And that way, the whole world will be blind and toothless. 01:43:20 – After what they did at the massacre? It’s only an eye for an eye. 01:43:24 – An eye for an eye only ends up making the whole world blind. In conclusion, Mahatma Gandhi may have used the expression, but no conclusive evidence for this has yet been discovered. It is also possible that the ascription is inaccurate and the books of Louis Fischer may have inadvertently helped to establish the attribution. A more extravagant version of the adage with the words “blind and toothless” was used by 1914. Thanks for your question. May all your faculties remain intact, and may peace come someday to planet Earth. Update history: On February 25, 2012 the citation for the 1982 Gandhi movie was added. Thank you so much for this iformatio. I thought it came from Exodus initially and grew from there. I am being asked my opinion on what justice means to me I wanted to use the famous quote but was not sure who to give credit to. Great ad very thorough information! Thank you. Hmmm…I was investigating this quote, as it is a good one to use today, 9-21-2011, World Peace Day/International Peace Day. Also, very ironic, that today is another execution for the State of Texas, right here in Huntsville, Texas, right down the street a few blocks from the University (SHSU) where I work, and that Martin Luther King III is present today with other peaceful protesters, outside the Wall Unit, along with Ross Byrd, the son of Rodney Bird, the man killed by Lawrence Brewer, who is being executed today. Enough said…think about it! The original eye for an eye was meant as a foundation for a national system of justice not for personal, individual application. I find it hard to understand that people don’t get this. I guess extreme pacifists who find this concept of justice wicked want all prisoners to be freed no matter their offense. You’ve raped and murdered my little girl? Oh, punishment will do nothing but bring us all down, I love you and forgive you please don’t do it again here’s a candy bar for you! This is not justice, and this one is responsible for any further evils done by that one. Forgive them from the heart, pray for them, do good to them, but don’t make meaningless the law by allowing the evil to go unpunished and usher in anarchy. It’s naive and dangerous to think a nation can follow this path. Perhaps I should comment about the selection of quotations for this website. When a quotation is examined it does not indicate that I condone the saying. Nor does it indicate that I condemn the saying. 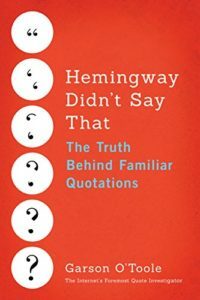 Intriguing quotations often can be described with one or more of the following adjectives: fun, interesting, entertaining, insightful, clever, influential, inflammatory, wrong-headed, egregious, reprehensible, truthful, and important. It is foolish to stretch Gandhi’s philosophy to say that he, or anyone adhering to similar beliefs, believes that criminals should go unpunished. It is not any man’s right to kill another, even when that person has committed a great atrocity. Having a criminal’s freedom restrained is an entirely different matter, as long as the law under which he is convicted is just. As Gandhi says, unjust laws are a species of violence, and it is our duty to protest them.